Many genealogists have “favorite” ancestors, those family members that capture our attention with an act of heroism, a heart-wrenching tragedy, a fascinating occupation, or perhaps just an interesting life. That favorite ancestor brings out something in each of us that inspires us, motivating us to learn more about their lives, the time period in which they lived, and the communities they called home. As someone with an affinity for a good beer, I’ve always been drawn to Frederic Jarand, a saloonkeeper in western Illinois. Born in Gandersheim, Germany in 1825, Frederic Jarand immigrated to the United States in January 1848, arriving in New Orleans on the Campbell. Following a well-worn migration path, Frederic moved up the Mississipppi River and soon settled in St. Louis, Missouri, where he married Amelia Bergfeld in March 1850. The family moved across the Mississippi to Madison County, Illinois for a short time, where a second daughter – Amalia Christina Frederica – was born. In 1856, the family relocated again, this time to Quincy, Illinois, where they remained for many years. Nestled up to the Mississippi River, Quincy is located in western Illinois about 140 miles north of St. Louis and nearly 200 miles southwest of Chicago. A substantial German population lived in the “Gem City,” which no doubt played a role in the Jarand family settling there. Over the next twenty five years, and at several different downtown locations, Jarand operated a saloon in the city. Following his death in April 1882, Frederic’s probate file includes an estate inventory, which offers an itemized listing of both his saloon and household. 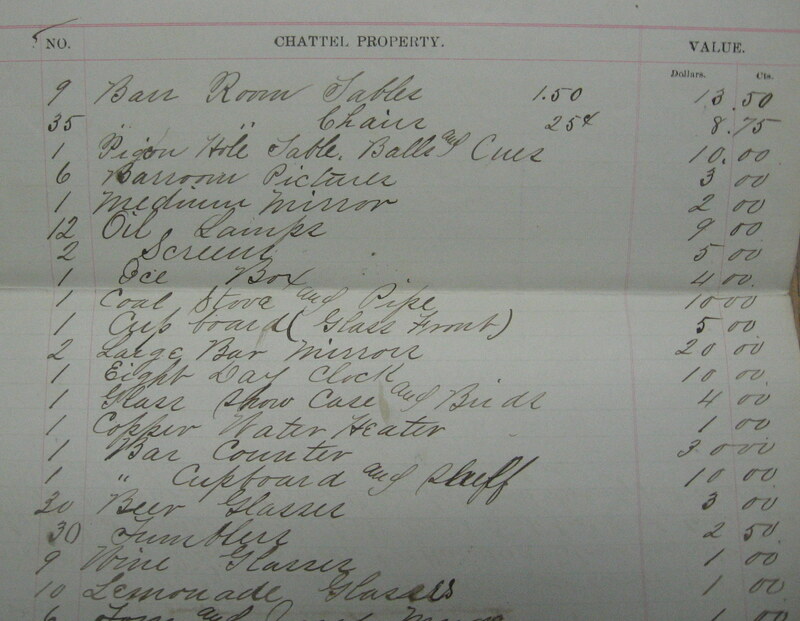 Here is an image from one of the pages, detailing several items from the saloon located at the northwest corner of Hampshire St. and N. 6th St. in Quincy. Frederick Jarand, Estate Records, Box 411, Adams County (IL). Detailing the beer glasses, tumblers, bar mirrors, tables, and other furnishings, the bar itself, and of course, the wine, whiskey, and other spirits, this estate inventory is one of my favorite documents, one of those “Eureka” moments we all strive for in our research. Given this inventory, I have a priceless glimpse into Frederic’s saloon, the furnishings, and the equipment he used in the daily operations of his business. Despite the gratifying success with his estate file, I still have much to learn about Frederic Jarand, his town of Quincy, Illinois, and his full-of-spirits profession. That will no doubt cross my mind the next time I visit my local watering hole and order my favorite IPA.